Warrant Arrest – On June 24, 2015 at 6:15am, Patrolman Andrew Altman conducted a motor vehicle stop on a vehicle near Route 9 in the area of the Beachwood / South Toms River border. As a result, it was learned that the driver, a 51 year old female from Bayville had an outstanding warrant from Ocean Township. The female was arrested and transported to Beachwood Police Headquarters were she was processed and released after posting the required bail. 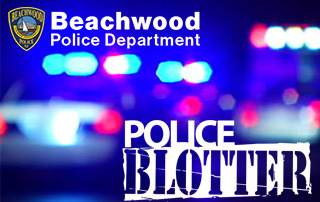 Criminal Mischief – On June 25, 2015 at 8:50am, Patrolman Justin Apel was dispatched to the Beachwood Community Center on Compass Avenue for a report of criminal mischief. Upon the officers arrival, he was advised that some time during the overnight hours, damage was done to a newly poured concrete section of sidewalk. Detective Daniel Altman has been assigned to follow up. Theft – On June 25, 2015 at 5:13pm, Officer Thomas Prince responded to a residence on the 100 block of Windward Avenue for a theft report. The resident reported that a trailer was taken from the property between 12:00pm and 5:00pm on the 25th. The trailer was valued at $5000.00. Detectives are following up and reviewing security camera footage from the area to gather additional leads. Fraud/Theft – On June 27, 2015 Officer Thomas Prince responded to a residence on the 1200 block of Windward Avenue for a credit card theft report. The resident was prompted to make the report after noticing fraudulent charges on a credit card statement. The case has been assigned to the detective bureau for follow up. Fire Call – On June 29, 2015 Officer Gina Bruno and Officer Keith Meissner responded to the area of Capstan Avenue and Lookout Street for a pole fire. Upon the arrival of the Beachwood Fire Department the pole was check and found not to be a fire hazard. Notification was made to JCP&L to check the issue. Warrant Arrest – On June 29, 2015 at 6:43pm, Officer Gina Bruno was dispatched to the area of Surf Avenue and Wave Street for a disturbance. Upon speaking to the involved individuals, it was learned that a 31 year old female from Beachwood had an outstanding warrant from Wall Township. The female was arrested and transported to Beachwood Police Headquarters where she was processed and posted bail. Theft – On June 30, 2015 at 7:35pm, Officer Gina Bruno was dispatched to a residence on the 300 block of Tiller Avenue for a theft report. The resident reported that there was no sign of forced entry but several jewelry items were missing from the residence. Detective Daniel Altman has been assigned to follow up.